Two posts in two days? Who would’ve thunk it? This July I begin by setting an utterly unsustainable rate of posting. But seriously, don’t expect one of these tomorrow, or for a little while. 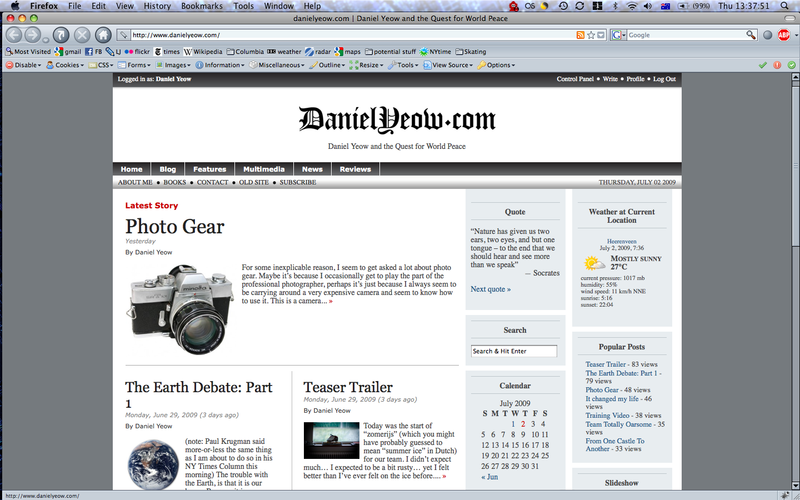 The new-look danielyeow.com has been here for a little over a month, and I thought that, since most of the kinks had been ironed out, I would talk a little bit about the site and give a brief tour. 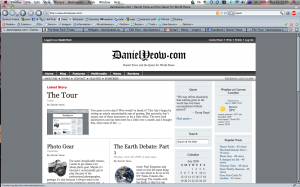 I’ve more or less imported most of the articles from the old site to the new site. 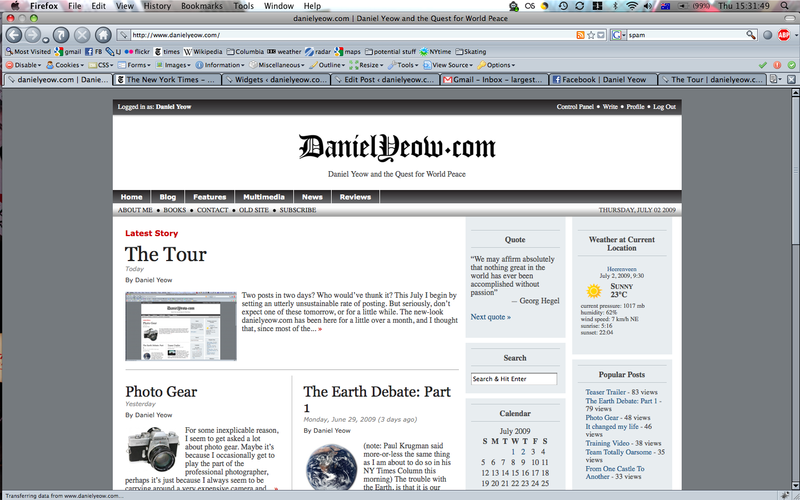 The old site still exists (look up, there’s a link to it in the header) and that link also takes you to a brief history of all the websites to bear the domain name “danielyeow.com”. I’ve only included articles which are reasonably long and reasonably good, so most of the short one-line or one-paragraph entries have been skipped. That is why, in the archives column (look down and to the right, in the grey boxes) the frequency of older posts is very low. Along with the snazzy new look, is an ability to subscribe via RSS. It is possible to also subscribe to an RSS newsfeed for each individual post, so you can watch discussions develop in the comments section (this hasn’t actually happened yet, but here’s hoping), and there is probably a way to subscribe to a particular category as well, although I do not know of it. With any luck I’ll be adding posts quite frequently so stay tuned. 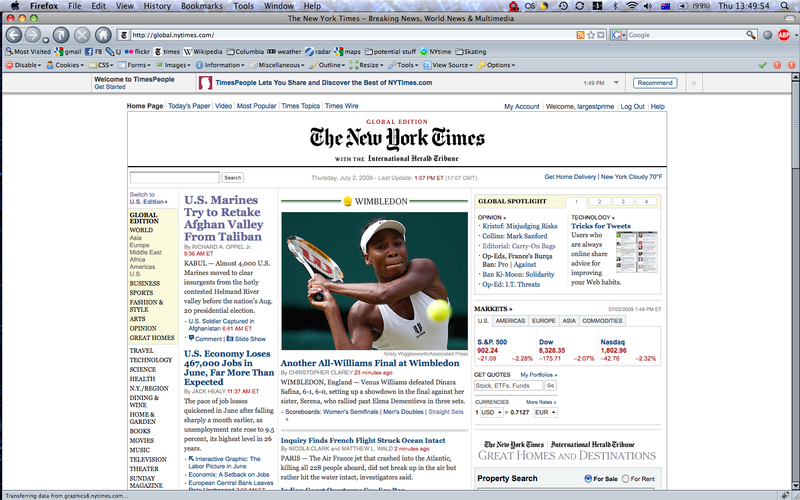 The layout, if it isn’t already obvious, is supposed to resemble that of a newspaper. The title suggests the New York Times, although since I have neither the inclination, nor ability to produce material at the rate that the Times produces it, the rest of the layout is very much not-the-New-York-Times. I have, however made a weak attempt at making individual article pages have a similar look, and while I am reasonably happy with the overall look and layout as it is, I would like to, at some stage, add a “below the fold” part of the page which would list articles by category or something like that. At the moment, since there isn’t a lot of material on the website, it doesn’t really matter too much. Each individual article has three little buttons to the top-right of the main body of text. These are, in order from left to right, email this page, print this page, and share this page. The functions are fairly self-explanatory (although nobody seems to be using them, so I thought I’d make sure). Linked images in the articles also have the rather cool feature of having what’s commonly known as a “lightbox”. All this means is that the rest of the screen goes dark and the photo pops up to fill the screen, or its full resolution, whichever one is the smaller of the two. This feature also works with embedded youtube videos, which is pretty fantastic in my opinion. So, whenever you see images, it is usually worth testing if they are clickable. Sidebar (grey) boxes are generally fairly standard – calender, weather, recent posts, archives, etc. The photo slideshow sometimes works, and I’m still figuring that one out. The quotes box is one of my favourites, and I sometimes wonder whether anyone has sat browsing my site and clicked “next quote” until they had exhausted all the quotes. At the moment, there are about fifty, but I’m sure that will grow slowly over time. Another interesting feature I’ve added is the page counts which can be seen at the bottom of each post. I’ve also generated a grey box which displays the 7 most-viewed posts. This has revealed some interesting trends. Recent posts tend to get viewed more, a lot more. Interestingly, most new posts jump very quickly up to about 30 before leveling off and adding page views slowly. This would suggest that there are about 30 subscribers to the site, even though that makes no sense (I can’t think of 30 people who even know about this website… well, maybe, but they wouldn’t all visit regularly). A handfull of articles are linked from other websites and have correspondingly higher pageview statistics, and whenever I link a page from my facebook, there is also a slight jump in numbers. 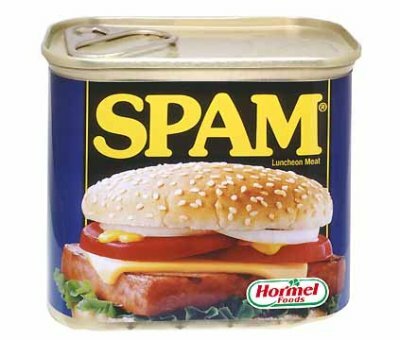 Something funny I’ve noticed in the comments section is the amount of spam that attempts to make itself stick. Most of it is the usual online pharmacy/dating site spam which is very easy to filter, and a vast majority of spam attacks on this website go straight to the bin. It worth mentioning some of the more creative methods used my spammers to circumvent most of the standard filtering tools. For a while the “Brave New Site” post was bombarded with 500+ spam messages a day by a spam-bot which would (1) create a random account on one of many free websites which allow you to post blogs (2) create a “poem” page on their blog containing a large advertisement for viagra/cialis/slimming pills/whatever (3) randomly generate text below this ad from a word list that was obviously taken from a proper literary text, then it would (4) link this page to some text in a comment on my page. This bypasses normal spam filters in several ways – first, it makes the computer think that the link is to an innocuous personal website (and there’s no real way of getting around that), the randomly generated text is especially clever because it bypasses statistical filters by containing lots of “normal” words, and at a “normal” frequency. I’ve managed to eliminate most of this spam. Still, spammers are relentless (is the effort really worth it?). The most perplexing spam is the spam that doesn’t try to sell you something. It takes the form of a random and often nonsensical name, paired with a very innocent and usually misspelled and grammatically awkward sentence. In fact, there is almost no way of telling that this isn’t just a random person who has happened on my site and posted a vaguely complimentary comment. However, if you google the text of the comment in “[insert text of comment here]”, then it becomes obvious. You see, if someone comments randomly on a blog, the chances that someone else will say exactly the same thing (especially if the spelling or grammar are a bit off) are actually quite small. When you google these things and get hundreds of hits, then it becomes very obvious that a computer program has generated the text. I suspect, these are “test” comments that spammers use to compile lists of websites and pages to spam at a later date. Usually, these can only be effectively blocked by banning an IP number range. Anyway, it is worth looking through some of the older posts on the site because, if they’ve made it to this incarnation of danielyeow.com, then they have survived the scrutiny of a number of website-look-changes and are probably more worth reading than some of the more recent material. Browsing by tags might be the way to go if you’re only interested in my videos, or my Melbourne Uni days, or whatever. You are also encouraged to comment and respond to comments and have little discussions (although if you use words like “viagra”, your comment will not go through). More photos will also eventually be added, although I am undecided about whether to post photos to BOTH this site and to facebook, or to do one or the other and simply link galleries between these sites. you know Nicole, if you really need that stuff, it’s nothing to be ashamed of, and there are any number of online pharmacies that would be more than happy to help you out.